« It’s Up To You, N.Y., N.Y! Most people, when they get a big city fix, come back afterwards and talk about the shows, museums, the activity of the city. 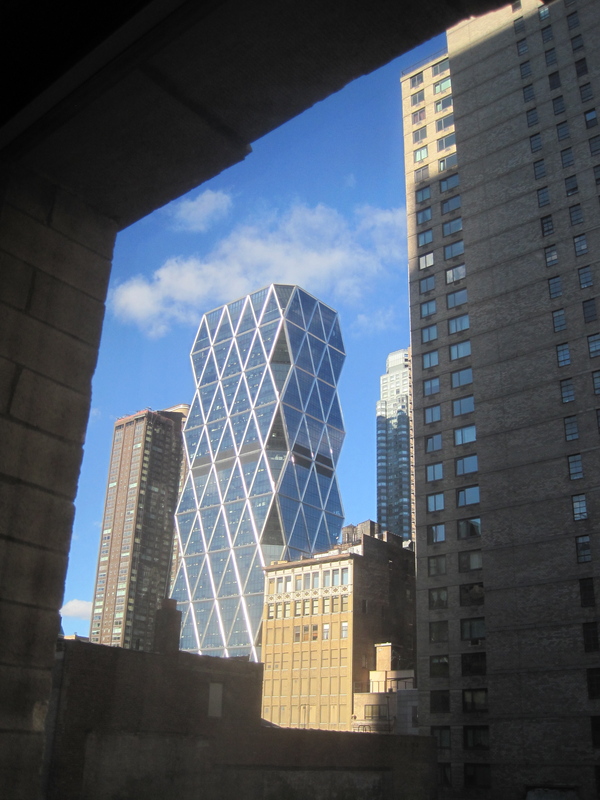 An interesting skyscraper, all diamond shapes, as viewed from my New York hotel room. I’m in New York and enjoying all that, but of course I just focus on the novelty of my surroundings. I’m staying in this kind of funky, weird but pretty good hotel called the Ameritania, on West 54th St.
It’s close to everything in Midtown, so it’s perfect. The neighborhood is interesting, too. There’s a weird skyscraper with all these diamond shape features towering over an area of old buildings. There’s an entertaining construction crew across the street noisily demolishing an old building. I call then entertaining because as I watched during a five minute period yesterday afternoon, the crew managed to dump a wheelbarrow full of old bricks on top of a guy (Thank Gawd for hard hats), set a small fire and almost drive a bobcat off the side of the building. 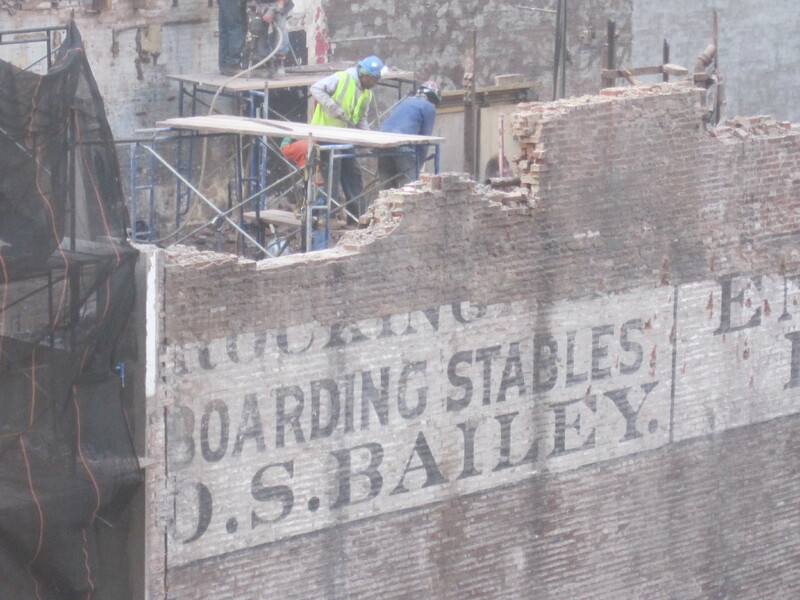 An old sign exposed by a Keystone Kops-style demolision crew, as viewed from my hotel room on West 54th Street in New York. But at least I have a photo of it for posterity. The room in this hotel is small, dark and Spartan, but it does its job. 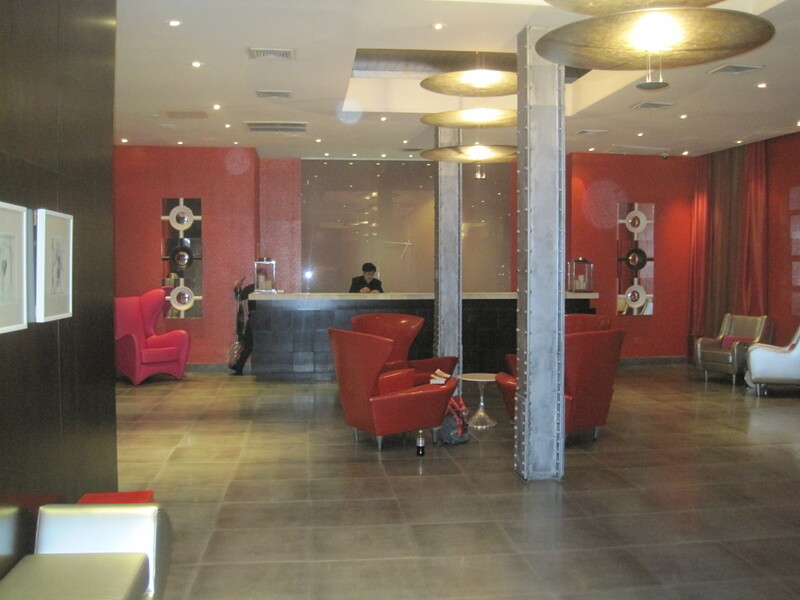 The hotel lobby is a complete contrast, with all this weird but fun future-retro furniture in reds and silvers and blacks. The people in the lobby are hip, the people in the rooms are not. Go figure. The funky lobby of the Ameritania Hotel, where I'm staying, on West 54th St. in New York. This entry was posted on November 20, 2010 at 2:06 pm and is filed under Uncategorized. You can follow any responses to this entry through the RSS 2.0 feed. You can leave a response, or trackback from your own site.